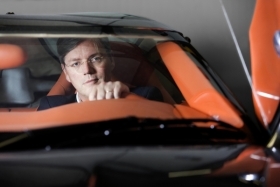 Spyker CEO Muller, pictured here in a file photo, said today about his company's Saab bid: "The last time I looked, which was a half hour ago, we were in the midst of the [Saab negotiation] process." DETROIT -- Dutch niche carmaker Spyker Cars NV hopes to reach an agreement with General Motors Co. to purchase Saab in “days, not weeks,” Spyker’s CEO said today. If that doesn’t happen, CEO Victor Muller said, Spyker may have to give up. “There is a point in time where we would say, ‘This is not for us,’ ” Muller said at the Automotive News World Congress. But for now, he said, “The last time I looked, which was a half hour ago, we were in the midst of the [Saab negotiation] process. GM is winding down Saab after not finding a buyer for the Swedish brand last month. The Detroit automaker had originally agreed to sell Saab to Swedish supercar maker Koenigsegg Group AB, but that deal fell through in November, moving Saab toward closure. Today, Muller said Whitacre made those comments after Spyker had offered a bid he believes is more attractive to GM than winding down Saab. “We have shown Mr. Whitacre the money,” Muller said. He declined to give details of the bid. But just offering to pay enough for Saab doesn’t solve all the difficulties of breaking off a brand that has been part of GM for two decades, Muller said. Muller acknowledged that his 130-employee company’s bid is a long shot. He said today’s speech was probably the first and last he would ever give at the Automotive News World Congress unless Spyker buys Saab. GM continues to say it is winding down Saab, although a sale could still take place. Whitacre has said multiple times that he’s pessimistic that GM will line up a deal. “It’s my job to reverse [GM’s] position and make sure that Saab is indeed saved,” Muller said. Muller said Spyker wants Saab so it can share product development costs, tap Saab’s dealer network and cut the cost of making each vehicle. He believes Saab can be “very, very profitable,” partially by sticking with its own DNA. Saab’s loyal buyers were sometimes frustrated by the way the Swedish automaker’s product looked under GM, he said. “People were interested in buying a ‘Saab’ Saab, not an ‘Opel’ Saab, for instance,” Muller said. If Spyker does acquire Saab, Muller said, he plans to hire more workers, not fire them. He said he wants to increase production capacity so the new company, which would be a Dutch public company called Saab Spyker Automobiles NV, can build Saabs along with a higher volume of Spyker vehicles. He said Spyker plans this year to make about 100 cars that will sell for $200,000 to $250,000 each.